Why? Because app saturation is just around the corner. How many apps do you have on your smartphone? Plenty right? Now, unlock your phone and count exactly how many of those apps do you use on a daily basis. Just a handful, correct? Google Play Store houses more than 2 million apps as of February 2016. The Apple App Store has nearly the same number. These are the two most popular app stores in the world. But, of the 4 million+ apps on these stores, I bet you have about 10-15, out of which you use about 5 regularly. Why this sudden lack of interest in apps? Well, you may have noticed how convenient life has become thanks to a bunch of apps we've come to trust. Yes, there was a time when apps threatened the very existence of desktop and mobile websites, but in the race to create an app for everything, few have found themselves to be successful in gaining market monopoly. Take for instance apps like Paytm. The mobile recharge app grew from being just that to a full fledged utility payments' app, an e-wallet, a fund transfer service and now also an ecommerce platform. With one Paytm app installed on my smartphone, I have never felt the need to install others like Freecharge, Oxigen Wallet, MobiKwik, etc. Similarly, in a more global scenario, apps like WhatsApp, Facebook Messenger and Snapchat have become synonymous with social messaging, with little heed paid to others such as Hike, Viber, BBM, etc. Everyday tech journalists like me are bombarded by calls from app developers, hawking the same old service oriented apps and repetitive concepts of apps with awkwardly spelt names. To be honest, these create little to no interest for us because of the lack of original thought behind the core idea of these apps. I don’t need another app for social networking, I am happy with the 3-4 app based cab companies I use, I don’t care for another fitness app that feeds me more unverifiable data, I’m won’t get excited if your restaurant discovery app has 10 more eateries on it than Zomato. In fact, communications apps take the cake when it comes to engagement and usage statistics in India. According to a report by Ericsson Consumer Labs, communication apps are the most popular apps in smartphone usage, not only in India, but also in US, UK and South Korea. As per a 2014 comScore report, majority of smartphone users in US don’t download any new apps in a month. Imagine the scenario now! India has always followed global trends when it comes to smartphone usage. Although India has not yet hit mobile app saturation, thanks to the growing developer community, the country is following on the heels of its western counterparts, and will soon see a slump in the app economy. Why? Unless you have been in hibernation, you must have noticed how more and more features are being added to existing apps these days. Skype added a number of bots that can read you the news, without you having to leave the app, Facebook also added doctor bots that can give you medical consultation from the comfort of Messenger, Slack bots can even help you order an Uber or a pizza, sans the hassle of navigating through multiple apps. This move towards consolidation of mobile apps only suggests what technologists are planning for the furture. A future without apps. Given that there is still a long way to go before bots become app replacers, there’s another medium that’s picking up pace and how! AI based voice assistants are becoming smarter by the day. Take for instance the new AI assistant Viv. Created by the founder of Siri, Viv is leagues ahead of its predecessor in its understanding of natural human language and human commands. For example, Viv can tell you the precise weather at 2:30 pm on Saturday, It can even order flowers and get them delivered to a friend’s doorstep. All this happens through simple voice commands, which Viv understands easily because of a dramatic new development in computer science called Dynamic Program Generation (DPG). Smart home devices such as Google Home, Amazon Echo and Apple’s rumoured IoT device also pose a challenge to app growth in the future. These devices will also function on AI based voice commands and will enable users to interact with their smart devices sans any apps. Again, for that to happen, we will have to wait for such devices to become commonplace. Nevertheless, the move towards an app free future has already begun. Google also announced Instant Apps for the Play Store, perhaps because of the same reason. 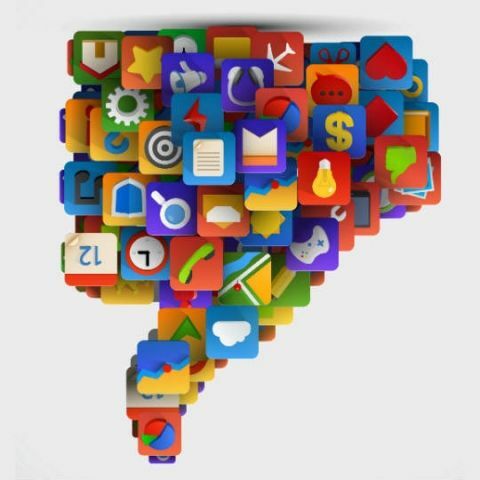 Google Instant apps allows users to use an app and its features without having to download the same. Not only do apps take up storage space, but the incessant ads that tag along with them are starting to irritate users. I for one, cannot tolerate another app ad telling me to play Clash of Clans. Hence, it is my sincere request to app developers - Please stop making multiple apps that do the same thing. We Don’t need them and we will not download them! Instead, focus on getting onto the voice, AI bandwagon, or be left behind in the race yet again.